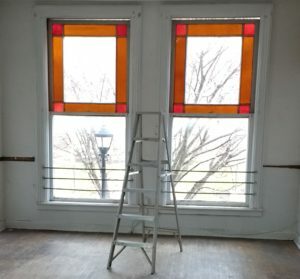 Over the years, due to home ownership and business expansion, I’ve stumbled my way into a number of demolition, construction, and reconstruction projects. While I’ve done a lot of this sort of work, I’m very aware that it’s far from what I’m best at. I’d say it’s more on the side of what I’m worst at. Still, it’s good to stretch oneself, and sometimes venture into tasks that lie outside of what’s comfortable. Relying on one’s limited skills to pull off a big project without support is asking for trouble. So I am beyond grateful that my brother, Michael has been along for the ride through all of the Solaluna restorations we’ve done over the years. Because of his knowledge and experience, we’ve saved a lot of time, money, and heartache. There’s a parallel with yoga: developing a personal practice involves learning to draw on one’s inner resources; it necessitates not always relying on the help of others. This is a vital, essential part of practice. Yet when unknown, uncharted waters emerge on the journey, it sometimes helps to have a guide, someone to ease the way. If you are looking for some support on your path, check out our schedule of classes here. We can offer guidance and resources whether you’re just beginning or you’ve been venturing awhile. There are times when progress with a project happens in dramatic bursts. At other times (and I would say, much of the time, actually) progress is incremental, slow, and more difficult to detect. This is as much the case with learning and refining a yoga asana as it is with restoring and rehabbing a space or a house. Sometimes, it can even seem that things go backwards for stretches. It might be easy to see the dramatic developments and the incremental plateaus as separate states, disconnected from one another. And it can also be tempting to want more of the big, noticeable changes to happen more often. Most anyone who has ever learned a skill (such as playing a musical instrument, learning to ride a horse, or learning to swim) can understand that plateaus build and lead to the more obvious developments. Slow progress that’s harder to detect is still progress (and still detectable). What gets in the way of seeing this progress is often just mental noise and impatience. Letting go of these can lead to a simpler, deeper satisfaction. Satisfaction that’s embodied in taking the many small steps that support the big changes. Solaluna has gone through three major renovation projects. The first was in the fall of 1999, when the studio opened. The second was 10 years later in 2009, when we renovated and expanded into the office and the little studio. Now we’re in the middle of the third, working in the lovely space on the north side of the building. With each project, there have been periods that can best be described as uncomfortable-waking-up-moments: instances of becoming aware that the scope of the project is more than imagined. In 1999 when Solaluna hadn’t yet hosted a class, we struggled to find a solution to the gaps in the studio floor, which delayed the project for several weeks. 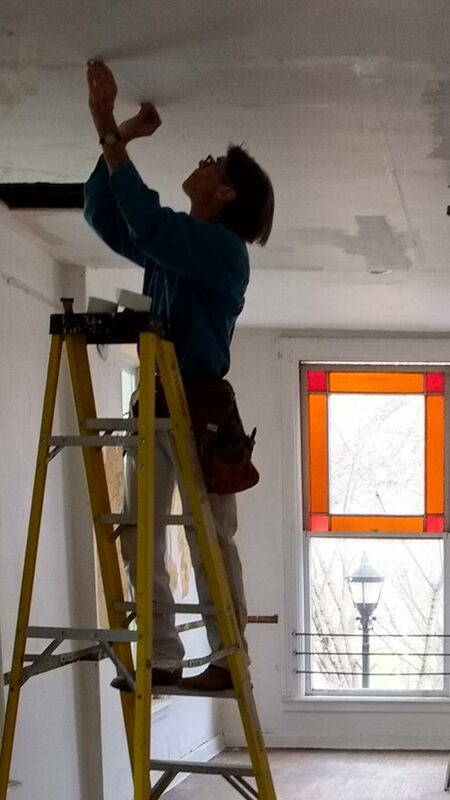 In our current project, the past few days have involved mulling over options with the ceiling and the walls. 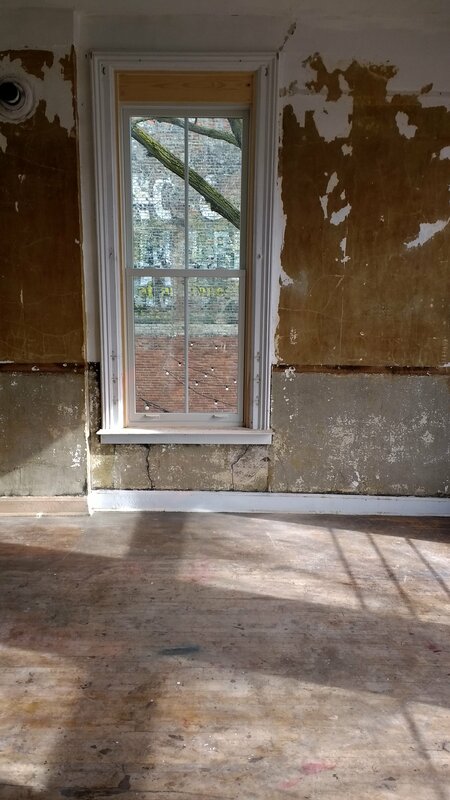 While the scope of the renovation has grown bigger (and therefore I’ve felt a few checking-with-the-gut-moments) I’m happy to say we’re getting a clear picture of what’s involved, and what we’re going to end up with. Overall I’m super excited for the Solaluna community! 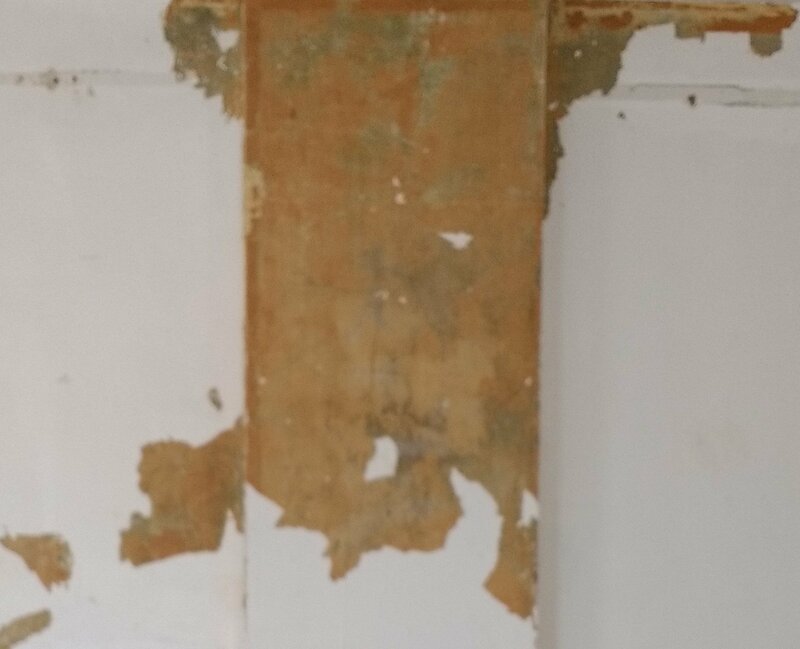 I’m struck by the similarity between the discomforts I’ve encountered in the renovation process and those I sometimes encounter in practice. The discomforts I refer to here are not the sort that indicates I’m losing support or straining joints. Rather, it’s the discomfort that arises because a status quo is being challenged. Inertia is being challenged. Preconceived expectations are being challenged. Many people encounter a period of initial resistance at the beginning of a practice. 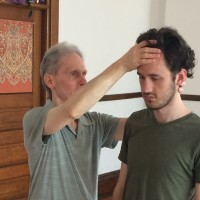 By meeting the resistance and moving through it, the resistance itself leads to a greater opening, and it can be a signpost for the direction to head (i.e. to stay with the practice). This is also true when someone is just beginning the journey of doing yoga, and it can happen when people return to practice after being away from it for some time. Resistance is often churned up in these moments due to the recognition of what the practice asks of us, and the differences involved between doing yoga and not doing yoga. With the renovation of the new space, the parallel is that we want to do it right. It doesn’t make sense to do a sloppy job and put band-aids over the blemishes. While that bigger commitment can stir up apprehension and questions, those things can sometimes be a sign that it makes sense to move forward, to commit to the bigger thing. So we’re looking at early May as a rough opening date. Projected openings are always tricky with projects such as this, but I think we’ve got a good chance of making it. We look forward to sharing the space with you when that time comes! This week I have learned a very basic lesson. It’s a lesson I’ve encountered before, and it might be more accurate to say it’s something I re-learned (especially so, given that I had to re-learn this particular thing a few times in the span of the last seven days, and I’ll no doubt find a need to absorb it again in the future). The lesson is that yoga is a great giver of perspective, and a great disperser of tumult and overwhelm. The divisions and hurts churned up in this election have had a way of pulling hard on the strings of emotion. And emotion has a way of pulling body, breath, and mind in all sorts of different and disparate directions. Yoga is miraculous in the way it can knit jumbled and fractured elements back together. It just requires the attention given to doing it. When we give to the practice, it gives back, offering insight, perspective, clarity, coordination. Wherever you are, whatever changes and uncertainties are pulling at your life, try some yoga and see what it has to offer. Or if you are nearby, come on down to a class at Solaluna. Here’s our current schedule. It is with a mixture of sadness and deep gratitude that I write to you about the life and death of my mother, Geraldine Stewart. She died in the care of her family, with the love and songs of her family, in her home, on Thursday evening, the first of October. It has been a long trip. She had a good run. She had her share of suffering and hard times, her share of tangled days and anxious nights. Yet the plainest thread that runs through all, evident and indelible, is her love in the world. That is the thread that remains. What remains is the care she instilled in her children (all 8 of them), and her affinity for the trees and flowers, birds, butterflies, and frogs of the world. 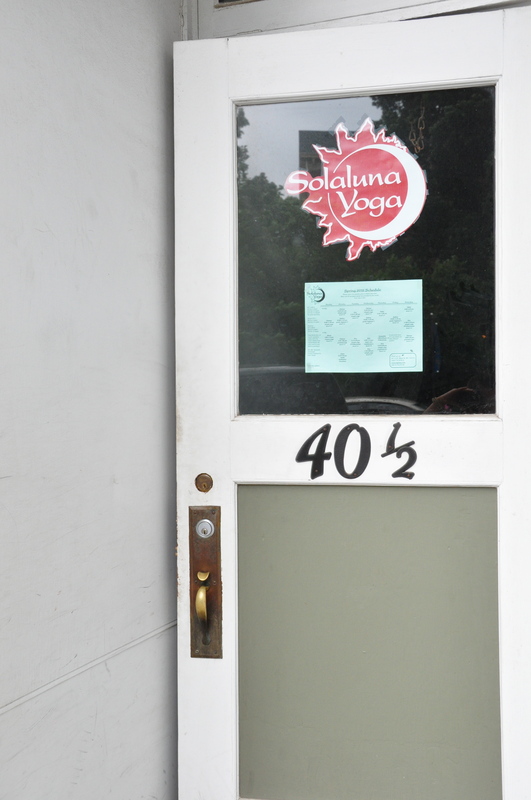 If you began coming to Solaluna after 2008, you may not have ever met my Mom (at this point, she took to doing her yoga at home). Still, it’s possible you could’ve bumped into her at the Oberlin Farmer’s Market, at IGA, or other spots around town, walking, or driving a maroon Subaru station wagon. Especially if you did not know her, I want to tell you something about her because there is so much of her in this yoga studio, and so much insight to find in her life. Mom began doing yoga in the early 1970’s after giving birth to the last of her children (me and my twin, Ben) at the age of 42. Describing her pregnancy and our birth as difficult would be an understatement (we were a month overdue). Yoga was a balm. It opened up a new world for her. 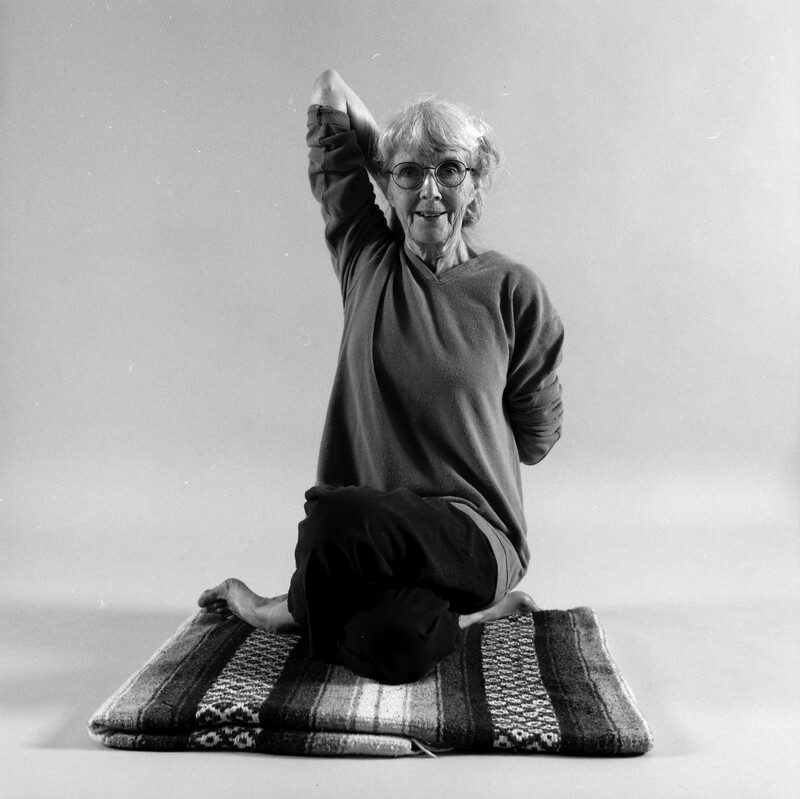 If you were to ask her about yoga at any point over the last 45 years, she would tell you that it was essential to her life, that in several senses it saved her life. Mom didn’t see herself as especially adept at asana, yet when she was attending classes at Solaluna she inspired so many people younger than herself with her practice. And it was among the most constant things in her life: ginger tea in the morning and then yoga with her blue mat on the blue wool rug in the living room. Over the past two years, different ailments took a toll, but she adapted her practice to serve her changing circumstances. We had a really challenging summer that involved multiple hospitalizations, frustrating coordination among different arms of the healthcare system, and finally a confirmation of cancer in her abdomen. Mom opted not to pursue treatment, and her clarity with this choice seems to me directly connected to the gifts she found in yoga. What she found beyond flexibility, strength, and even beyond the sense of calm was the possibility to meet the certainty of her own demise with grace and acceptance. Even as formal asana practice became shorter and less active, even as it eventually ceased altogether, there was yoga. Caring for her became a familial and a communal yoga, with Mom as the heart at the center. My good friend, John Seyfried took the photo below in the fall of 2003. It is a picture that speaks for itself. 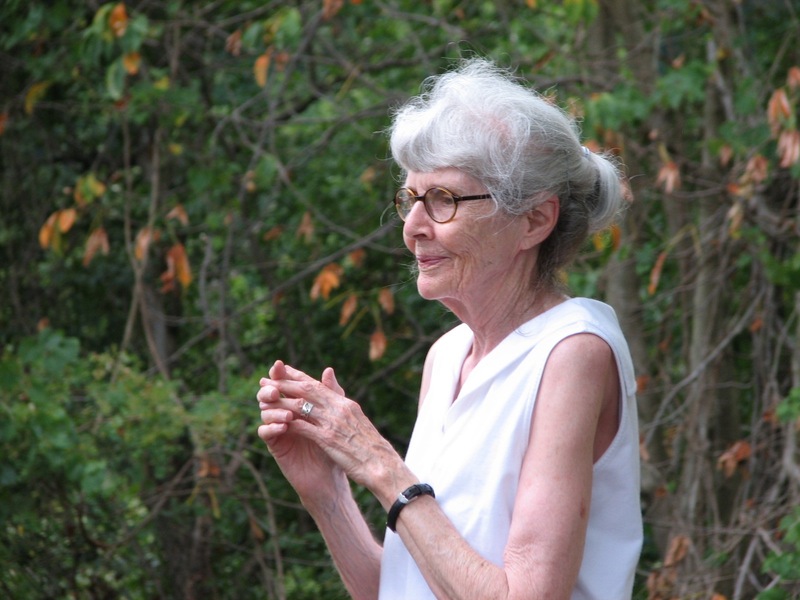 So Geraldine, my Mom, my teacher, my student, my friend, you are deeply, achingly missed. When it comes to conducting classes in moments such as this, I’ve found for myself that there is a solace in sharing the practice. This is to say, I will teach my usual 9:00 and 11:00 AM sessions on Saturday, October 3rd. I may be a little rough around the edges and I will shed tears, but I don’t mind. If you’re ok with that I hope you’ll attend. Here’s an audio practice that combines seated and standing asana. It’s a beginning to intermediate-level practice. Familiarity with moving from sitting to downward dog via crossed legs, and transitioning from wide-footed standing poses to a vertical lunge with the back heel off the floor are prerequisites for this practice. From childhood onwards there are few things someone can call you that are worse than “quitter”. But wait a minute, there are also positive connotations to quitting, right? Quitting smoking or another bad habit sure is a positive thing. And. . . well, that’s actually the only thing I can think of that puts quitting in a positive light. Mostly it’s something we are taught NOT to do, at almost any cost. So I want to stand up for quitting. I want to encourage you to do it, for reasons I’ll get into below. Sure, there are times when persevering is a better choice than quitting. But we are so flooded with these stories of quitting=failure and persevering=success, I don’t think I need to write about them. What doesn’t usually get discussed is what a profound purpose that quitting serves for any of us to function and thrive. This can range from the everyday–you quit one task because it’s time to attend to another, you quit eating because you are full–to the more significant decisions like quitting a relationship or a job that isn’t working. Sometimes persevering works, but there is often a point when persevering just ends up hurting you and quitting is the skillful thing to do. The yoga of quitting is recognizing when that shift happens. The yoga of quitting also involves awareness of how it feels after you quit something. If you stay alert in that space, you will possibly notice two things. One, there may be some yucky feelings left over from ingrained beliefs about quitting. Two, there are also other feelings, which might, in contrast, be quite pleasurable. I would describe it as a feeling of relief, spaciousness, and ease. Quitting one thing opens up space for other things. This is kind of obvious but also worth sitting with. I remember a period of time when I was a music student and I played both the clarinet and the cello. I was enthusiastic and dedicated to practicing each one. I was getting better at both. But I was aiming for the Oberin Conservatory, and there came a time when I just knew I would have to step it up if I was going to get in. There weren’t enough hours in the day to do that with both instruments. I had to face it: I couldn’t do both. Not at the level I wanted. I had to let one go. I quit the clarinet, and it still hurts to write about it! I was heartbroken at first, but looking back, I absolutely did the right thing. I was then able to focus on the cello, and I did get into Oberlin. What is more, playing only one instrument opened up a world of pleasure that I didn’t have access to before. I felt spacious, and I could really dig into my cello studies. I immersed myself in the music. I didn’t feel so tense all the time, so worried about whether I was going to be able to fit these two different things into my schedule, always feeling behind on both of them because I was trying to do too much and was spread too thin. This story might apply to you if you are an achiever. If it is your inclination to do a lot of things and say yes to every opportunity, you might find it refreshing to quit something and feel the spaciousness that arises. 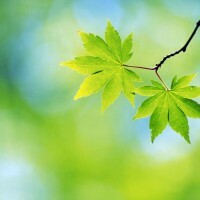 The quitting opens up the space, so that other things can take root and grow. Quitting Is Part of Success. Like my story shows, quitting something doesn’t have to mean failure. It can actually be a crucial part of success. Here is another example: Say an olympic athlete wins a gold medal. That’s a big success. Behind and underneath that big success are hundreds if not thousands of both little and big quittings that have made it possible. . . . Everything from the macro level, like quitting other sports or activities to focus on just one, or perhaps quitting eating certain foods… to the micro level, like quitting certain techniques or habits that are getting in the athlete’s way, or quitting certain negative thoughts in order to repopulate the mind with more positive ones. Another way of saying this is that our brains get really crowded when we try to add new behaviors, thoughts, or habits without first clearing some space for them. Fuller success comes from a more spacious place. Indeed. Letting go (quitting) has the dual quality of being scary/painful on the one hand, but so easy and such a relief on the other hand. Skillful quitting, like anything, takes practice. Meditation is great for this. Here is a short practice if you would like to experience some of that feeling of ease and relief that comes with quitting. Either on your yoga mat or in some other place where you can sit comfortably, sit in an upright position that you can maintain for a few minutes. Sukhasana (crossed legs) elevated on blankets is ideal, but a chair works well too. Turn your attention inward. Observe your thoughts for several minutes. Then, one by one, quit them. Just say “I quit.” Let them go. They will be there when you need them, but right now, you don’t need them. You can just quit them. If your mind wanders, don’t worry about it, because you are still practicing quitting. You aren’t doing all the other things you do in your life. You have, for the time being, quit doing those things. Even if your thoughts take over and you can’t manage to quit thinking, you are still doing the practice because you have still quit a lot of things just to be there. Let pleasure guide you with this. Do you get relief from quitting? or is this an uncomfortable space? If you get pleasure from this, it’s okay to trust that. If it’s difficult to be in that space, be gentle with yourself and maybe start with smaller quittings at first. We always like to hear about your experiences with practice. If you have a comment, leave it here. There are a just a few more spots left in the Spring Intensive. With these remaining slots, we can make space for partial attendance. If you’d like to drop in for just one or two days, let us know. This coming week, another opportunity exists for some extra yoga immersion. In partnership with Jill Blake and Piece of Quiet Studio, I will be teaching 2 special classes on Tuesday the 24th (Restoratives), and Thursday the 26th (Breathing). Both are at 2:00 PM and run to 3:30. Tuition for these events is a drop-in of $15/$10 for students, or pay what you can. For more information on these events, click here. And before we get to this week’s post from Chelsea, please note, Ali’s Tues. 7 PM vinyasa is not happening on 3/24. 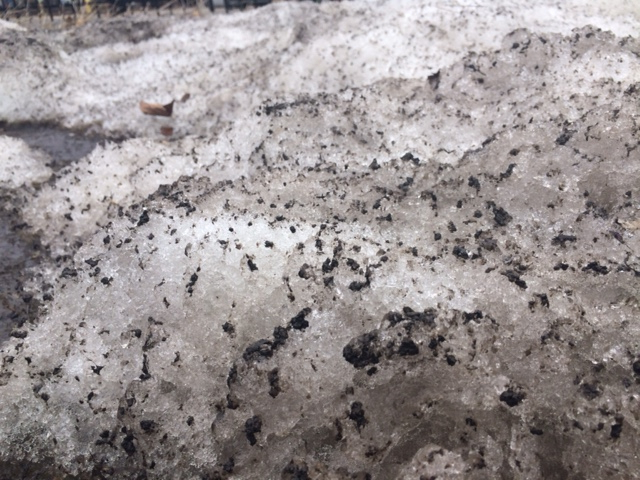 Here in Massachusetts, everyone is talking about it: The snow is melting! After the winter we’ve had, this is big news and a big relief. 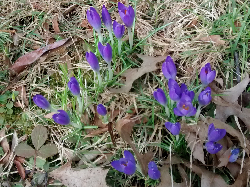 As much as we love that Spring is coming and the snow piles are shrinking, the residue can be pretty unattractive during this in-between time when the snow is no longer fresh but hasn’t yet disappeared…. The remaining piles seem to be magnets for dirt and grime. The more they melt, the more filthy water runs down the streets and sidewalks; piles of grey (or yellow), half-frozen sludge remain for now; and all the run-off from the melting creates lots of mud. When I was driving past some ugly sludge piles the other day, I realized that at times something inside a person needs to melt as well, and it can be just as messy. I’m talking about big things but also little things, like a knot of muscle in your back, a ball of worry or tension in your gut, or a tightening of your jaw in anger. But melting, little by little, is possible, and yoga can help. In a yoga class, most of life’s outward distractions get left at the studio door, which leaves you face to face with any inward distractions, and whatever presents itself in your own body and mind. This can be a very uncomfortable place to be. But it is also an opportunity. It’s an opportunity to let go of stuck patterns that have a hold on you. In a safe and supportive class context, it is less unpleasant to engage this process of melting, compared to trying to make these changes on your own. Remember that sometimes in our bodies–just like an icy walkway–things get messy before they become more ordered and tidy. In the process, it can feel about as lovely as a grimy slush pile. But that doesn’t mean that there isn’t a lot of beauty underneath it all. And it doesn’t mean it’s not worth the melting. What is Spring without a little mud? What would rivers be without snow melt to feed them? We need the melting. And we need not fear the messiness of it. Keep in mind that all that beautiful messiness benefits from a container. One of the important things you get when you purchase a yoga class is that container, a space in which the messiness of melting is supported and even encouraged. Spring can be such a busy time that getting to a yoga class becomes challenging. But if your life is hectic, now might be exactly when you need the container of a class to support and guide you. A little structure can go a long way. I invite you to come, with all of your messiness, to one of Solaluna’s studio classes, where teachers endeavor to provide a friendly and supportive space in which to melt and open the stuck parts of yourself. Click here to see all the schedule information. As always, if you have any questions, concerns, or comments, please don’t hesitate to get in touch. Looking forward to a muddy Spring! The Spring Intensive is two weeks away, and registration is chugging along, just about half-full at this point. If you are looking to jump in, remember that the early registration date is a week away, March 20, the first day of spring. A few days ago I was having a conversation with Renee Steinbrenner about the first time she participated in an intensive. It was a year or so after she had begun attending classes at Solaluna. There were three things she mentioned about the experience that happen to be relevant to today’s subject. First, she mentioned being a little apprehensive, but excited to do it, and she ultimately surprised herself with how much she could do. Third, she discovered, and continues to find much more motivation and ability to practice at home following an intensive. These three things all connect to a sense of enthusiasm for yoga, which is the subject of today’s post. We’ll also look at how to handle that enthusiasm when it’s present. So what needs handling or dealing with when someone is really motivated? Being fired up to do yoga is great when it occurs… What’s the problem? As it happens, people often fluctuate between periods of interest and disinterest. This is completely normal, but sometimes the cycle back and forth happens in a way that starts to deplete the practice. Sometimes, exactly in the moments when yoga is most awesome and interesting, the wheel of attention starts to turn the other way. Energy and focus dissipate. Fortunately, yoga itself offers a lot of insight as to why this happens and how to avoid it. Yoga can help distribute enthusiasm so that it’s more even, with fewer highs and lows. Finding a space that supports healthy challenges. Gaining inner resources to keep things going. Enthusiasm can lead a person to locate these things, and they in turn can feed and nourish enthusiasm. Still, this process can sometimes appear mysterious and haphazard. In order to better understand enthusiasm then, we’re going to explore the meaning of a very important Sanskrit word. Tapas (not a Spanish small-plate meal). In yoga, eagerness for practice is expressed powerfully in a single word: tapas. It literally means heat, and is often translated as strong desire for practice. More than an abstract idea, tapas is viewed as a substance that may be gathered or expended. Tapas can wax and wane. Some circumstances and actions support strong tapas while other conditions drain it. … and before you know it, the practice is in the weeds and enthusiasm gets drained. One reason this happens is that enthusiasm requires energy. It has an intensity that can’t be sustained all the time. Taking a break is perfectly reasonable. Yet there are ways to step out of the intensity of tapas without letting go of the reins completely. This connects to the second reason for depleted enthusiasm. Eagerness serves people when it can be channeled into something that fits their interests and abilities. If someone is inspired to expand their yoga but they don’t connect with anything that meets their motivation, then inspiration will dissipate. On the other hand, tending to a few elements that inspire and absorb enthusiasm goes a long way toward keeping the practice as steady flame. If you happen to feel ready to move a step beyond the demands of a regular studio class, if you are interested in connecting with people who share a similar inclination, and if you’d like some help in supporting a home practice when you can’t get to class, then the Spring Intensive is definitely something to look into. To find out more or to register, click here.